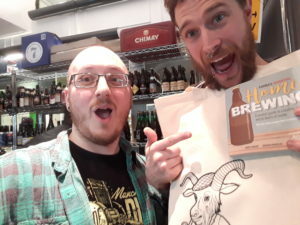 We’ve recently being listening to ‘By The Mash Tun‘ podcast, we love a good podcast about brewing and it was great to find one that was UK based. So when Mike and Cal contacted us about paying us a visit we couldn’t wait to meet the guys. 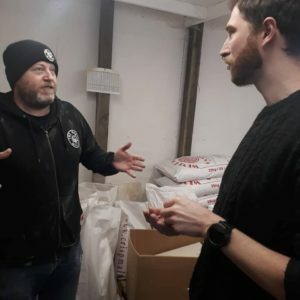 By The Mash Tun is a podcast hosted by a couple of nerds where we brew some beer, drink some beer and have a chat about beer. 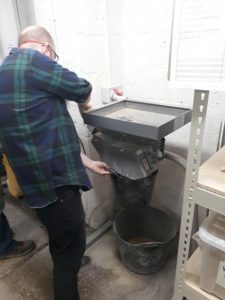 Each episode we brew a particular style of beer and during the “mashing in” (when the grains steep in warm water to extract their sugars and delicious flavours in something called a “Mash Tun”) we talk about that beer, how we’ve built our own recipe and drink other commercial examples of the style. All this, recorded whilst we sit By The Mash Tun. It was great to meet them and to talk about recipes and learn how they always use our products for their recipes, and understand a bit more about their home brewing experiences. We of course also gave them the grand tour of the milling room and hop cold store so they could see where all of their ingredients come from and how we ensure that everything is the best we can offer to our customers. They also had chance to have a go at milling their own malts for their next recipe. We all came up with a great idea too, that seeing as each of their episodes was about a single brew day and recipe that features on their podcast that we should start to put these recipes on our site so that everyone who listens can then have a go at brewing the same beer. So from episode 20 we’ll be featuring these kits on our site in their own category to make them nice and easy to find and order to brew at home. Be sure to check out and subscribe to their podcast, and then pop back to the recipes on our site which will be increasing over the weeks.